Organization development activities intervene in the interactions of human resource systems, such as formal and informal groups, work culture and climate, and organization design to increase their effectiveness using a variety of applied behavioral sciences. Organizational development is an ongoing, systematic process to implement effective change in an organization. Organizational development is known as both a field of applied behavioral science focused on understanding and managing organizational change and as a field of scientific study and inquiry. 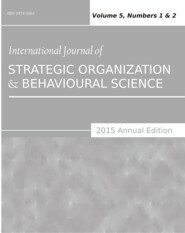 This peer-reviewed International Journal of Strategic Organization and Behavioural Science (IJSOBS) ISSN 0974-3464 is interdisciplinary in nature and draws on sociology, psychology, and theories of motivation, learning, and personality and other related issues.